Highlights this week include "The Festival of Festivals," music and comedy on wheels and on the water, and new songs by two Rankin family members. Photo by Jason Cook from the Torontoist Flickr Pool. 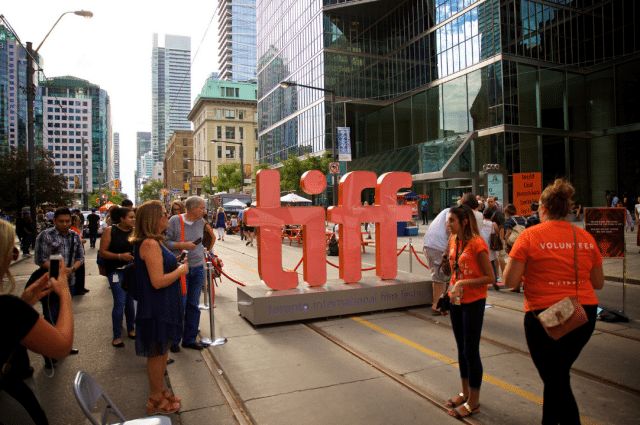 The Toronto International Film Festival arrives today, slightly downsized in comparison to previous years, but still boasting more than 300 films from around the world, plus oodles of celebrity sightings, some free programming at various festival locations (including a screening of Dunkirk at the newly reopened Cinesphere, and the pedestrian-only festival strip on King Street from University to Peter), and many, many bars (some open to 4 a.m.) and brands looking to cash in on the cachet. To September 17, various cinemas, FREE-$18 (and up—way up). With school starting today at Toronto’s universities, Bad Dog Theatre Company is hosting a Homecoming Weekend for alumni and current students, mashing up experienced performers with new and emerging improvisors. A special edition of Nelu Handa’s Yas Kween, featuring mostly women of colour on the bill, anchors tonight’s programming. Tomorrow night features the annual Anything-But-Improv Talent Show, and Saturday, after an edition of Bad Dog’s long-running flagship show Theatresports, the Mary Haynes Award will be presented to longtime Bad Dog stalwart Kerry Griffin. To September 9, Bad Dog Theatre (875 Bloor Street West), various times, $5-$15. The Manifesto Festival and the F-You Forgiveness Project are collaborating on a Block Party, with DJ Grouch and Daquan headlining, plus local food vendors and food trucks, outdoor games, and prizes to be won—fun for the whole family. Daniels Spectrum (585 Dundas Street East), 5 p.m.-9 p.m., FREE. There are two album release shows of note tonight. Partner is at the Horseshoe Tavern (370 Queen Street West, doors at 9 p.m., $10.50 in advance), releasing their In Search Of Lost Time LP with a bill—NOBRO, Sportsfan, and Triples—organized by veteran rock legend Dan Burke. And Bunny—a new outfit featuring members of The Bicycles, Woodhands, The Magic, and more—is releasing their self-titled debut LP with guest Sandro Perri at the Tranzac, where their video for “Aloo Lemmi Noyoo” was filmed (see above). Tranzac Club (292 Brunswick Avenue), doors at 8 p.m., show at 9 p.m., $10. A pic from the 2011 Dragon Boat Race Festival. Photo by Dean Bradley/Torontoist. The Cabbagetown Festival shuts down a swatch of the neighbourhood along Parliament and Carleton streets, and extends all the way out to Riverdale Park. On the streets (and in the park), there’ll be lots of local vendors, live music, and a skateboard park. To September 10, Parliament Street (Wellesley Street to Gerrard Street) and Carleton Street (Parliament Street to Ontario Street), Saturday 11 a.m.-11 p.m., Sunday 11 a.m.-7 p.m., FREE. 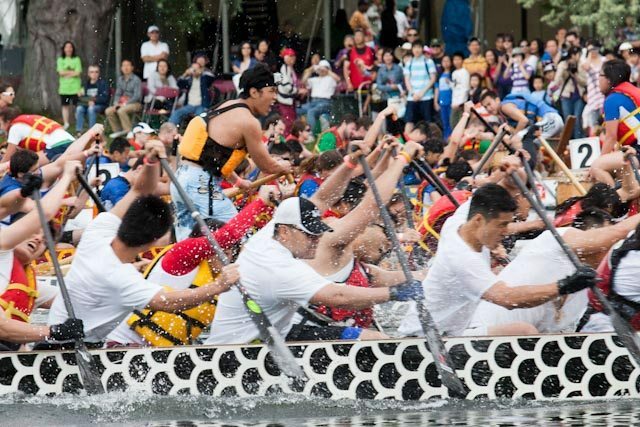 The GWN Dragon Boat Challenge marks the end of the summer racing season, and has dozens of crews from various categories racing during this two-day festival, which also features kids programming, live music, food vendors, and more (all on dry ground, natch). To September 10, Marilyn Bell Park (851 Lake Shore Boulevard West), Saturday-Sunday 9 a.m.-4 p.m., FREE. Tim Gilbert performing stand-up for the paddling audience of the first Comedy On The River trip. Photo by Dan Galea. Everyone will need a paddle (or at least, a spot in a boat) for the Comedy On the Humber canoe trip and comedy show. 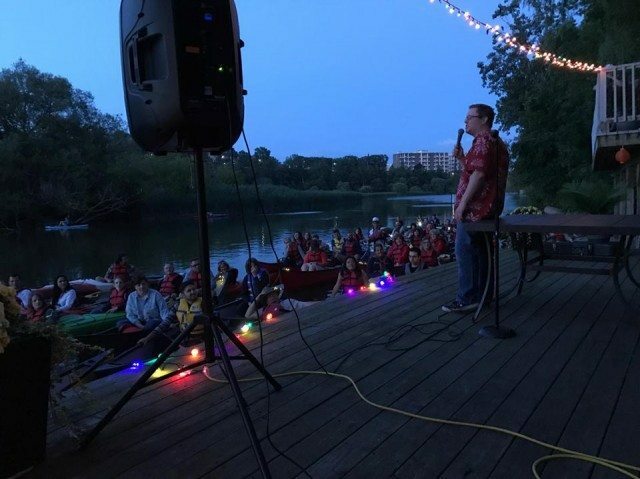 Hosted by local comic Dan Galea and Toronto Adventures, audiences convene at King’s Mill Park and then paddle to an undisclosed location to float and watch some of Toronto’s top comics deliver sets from a dock. This second edition of the experience is stacked, featuring Pat Thornton, Sara Hennessey, Dawn Whitwell (see Monday for more on her), and more. Tickets for the event must be booked in advance (you can bring your own canoe, to knock a few dollars off). King’s Mill Park (105 Riverwood Parkway), 5:30 p.m. meet, 5:45 p.m. departure, $24.50 ($20 w/ your own canoe). Back on solid ground, the Ground Floor Comedy showcase, produced by Exclaim! 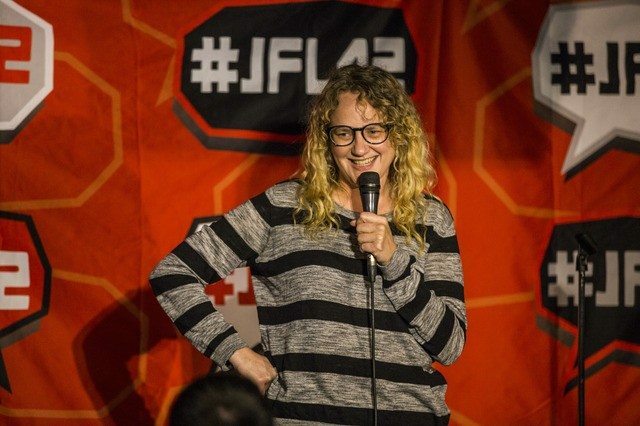 Comedy‘s Julianna Romanyk and hosted by recent JFL Homegrown contest winner Courtney Gilmour, is a fully accessible show in many senses of the word; in addition to being held in an accessible space, it’ll feature live captioning for hearing-impaired patrons. In addition to the bill of comics (including Bobby Knauff, Desirée Walsh, Jamieson Donnell, and more), the show will feature the Toronto premiere screening of Andre The Anti-Giant, a short film by comic and disability advocate Andre H. Arruda, who passed away in 2016. A portion of the show’s proceeds will go to the StopGap Foundation. Second City John Candy Box Theatre (99 Blue Jays Way, 3rd floor), 9:30 p.m., $15-$20. The eighth annual Toronto Bicycle Music Festival takes cyclists from a downtown park out to the west end to enjoy sets by bands like Hooded Fang, Bernice, and more, all powered by volunteer pedallers who will generate power for the sound equipment. Trinity Bellwoods Park, noon meet, 1 p.m. departure for Humber Bay Park West, music at 2 p.m., FREE (registration encouraged). A member of east coast music family “royalty,” Heather Rankin rolls into town with new solo material, having spent part of her summer before her tour on the Canada 150 expedition with other artists and scientists from across Canada. Hugh’s Room (2261 Dundas Street West), 8:30 p.m., $30 in advance ($35 at the door). Dawn Whitwell celebrates five years of her Dawn Patrol series tonight with a fundraiser for the Houston Food Bank. Photo by Michael Meehan. Organizers and performers Lauren Toffan and Amy Lockwood present Booze and Bumps, a cabaret fundraiser and awareness show for fetal alcohol spectrum disorder. Other performers on the bill include Caitlin Langelier, Shaina Silver-Baird (of Ghost Caravan and Crooked House Road), and Chris Murray, with accompaniment by Danielle Kolenko. Saving Gigi (859 Bloor Street West), 8 p.m., $10. Comic Dawn Whitwell, one of the city’s top teachers of stand-up (and no slouch herself), celebrates the five-year anniversary of her showcase Dawn Patrol by turning it into a fundraiser for the Houston Food Bank. Comics on the stacked lineup include Hoodo Hersi, Definition of Knowledge, Pat Thornton, and more. Comedy Bar (945 Bloor Street West), 8 p.m., $7 (all proceeds to Houston Food Bank). Toronto-raised screenwriter (Speed, The Last Castle) and TV producer (The Americans, Justified) Graham Yost is the special guest of the ROM Speaks lecture series. For this special TIFF edition, Yost will be interviewed by Dan Levy (Schitt’s Creek). Royal Ontario Museum (100 Queen’s Park), doors at 6:30 p.m., lecture at 7 p.m., $18-$20. Clinton’s Tavern (693 Bloor Street West), doors at 7 p.m., song at 8 p.m., $5. Writer and wit Monica Heisey is tonight’s guest on the Dark Nights profile series. Photo by Corbin Smith/Torontoist. The BetterTO group presents A Brief History of The Toronto Housing Crisis, a panel discussion featuring Claire-Helene Heese-Boutin, chair of the Parkdale Neighbourhood Land Trust, and Greg Suttor, a senior researcher at the Wellesley Institute. Moderator Shaker Jamal and his guests will explore housing related questions such as the origin and purpose of Toronto Community Housing, the previous 1980’s Toronto housing crisis, and the current state of affairs. No-One Writes To the Colonel (460 College Street), 7 p.m., FREE. Slate Magazine has the Canadian debut of its pop culture panel Culture Gabfest during TIFF, and its regular panelists—Stephen Metcalf, Dana Stevens, and Julia Turner, plus Toronto-based Slate music critic Carl Wilson—are expecting some TIFF-releated guests to join them to talk about the past week’s cultural happenings (including, no doubt, some TIFF ones). The panel, organized by Slate and the Toronto Public Library, is free; an exclusive afterparty nearby, where guests will get a chance to hobnob with the mystery guests and Slate staffers, is…not. Toronto Reference Library (789 Yonge Street), 7 p.m., FREE (afterparty tickets $125). Monthly artist talk series Dark Nights welcomes Monica Heisey as its special guest tonight. 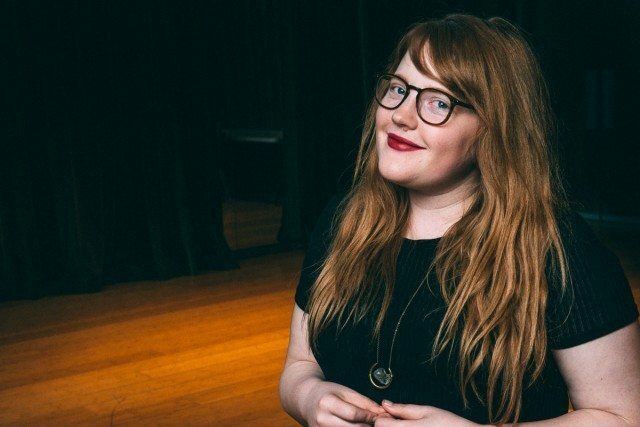 Heisey, a 2015 alumna of Torontoist‘s annual comedy profile series, is the author of I Can’t Believe It’s Not Better, a staff writer on The Baroness von Sketch Show, and a contributor to an arm’s length long list of magazines and publications, will talk about her experiences as a writer and editor (for Vice‘s Broadly, among others). Gladstone Hotel (1214 Queen Street West), 7 p.m., PWYC.